As I prepare my report on these last two months in the ministry, I have this thought on my mind to present to the brethren. Every promise in the Bible is ours, every verse and chapter in the Bible is ours, and every exhortation and commandment in the Bible is ours. The Bible, provided by a pure, holy, sinless soverign God is ours, so let us therefore stand in and on His Holy Word. I had the privilege to attend a church service at Bay City Baptist Church two old soldiers of the Cross. Pastor Dewayne Phy (53 years as a pastor) and Pastor Bill Watson (50 years as a pastor) they both preach that day and what a pleasure to hear old soldiers of the cross. Pastor Phy preached on “I will know you in heaven” and Pastor Watson preached on “Perilous times are here.” I also want to congratulate Bay City Baptist church of Bay City, TX on their 50th anniversary. We visited approximately 150 inmates, passed out bibles, tracts, and calendars. The gospel was shared with 75+ men. The response varied from they were not interested, would consider what was explained to them, were saved, (6 men) or just wanted to talk about general things. I want to thank Pastor Shawn Nichols and BDBC for making this day a day of witnessing, loving, and praying with men who are incarcerated. I also want to thank BDBC for generous supply of tracks and 8 individual plastic carrying trays. I will use the trays in the future when a multiple of persons what to go cell-to-cell witnessing. I also graduated 50 men, from Wayne Scott Unit, in Angleton, TX, for completing a six month training course call “Voyager” This course discusses how to mind is controlled by good or evil. My statement to each lesson is this “Whosoever controls your mind controls your thoughts, and your thoughts control you body/actions.” The Saviour or Satan! Your choice. 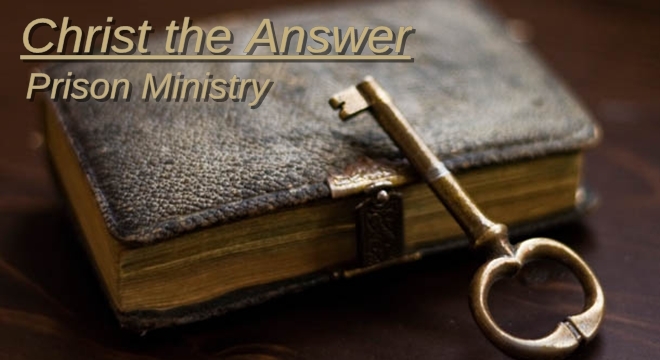 I thank you all for your vision in supporting Christ The Answer Prison Ministry with your prayers and encouragement. In the months of March & April, 24 men made professions of faith. Again, thank you for your prayers and support. There is so much that could be testified to concerning God’s blessings on this ministry.